The Marion Popcorn Festival is one of Ohio’s premier festival events, named one of the Top 100 Events in North America by the American Bus Association. The Marion Popcorn Festival is held each year the weekend following Labor Day. The festival is open Thursday, Friday, and Saturday from 11:00am to midnight. 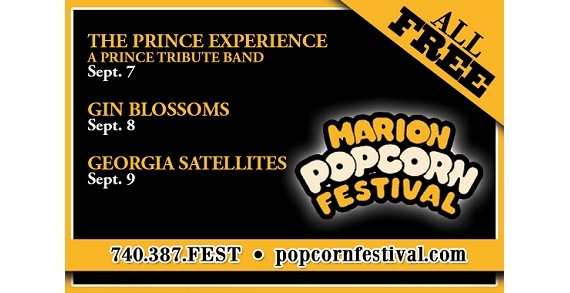 Performing this year: The Prince Experience: A Prince Tribute Band on September 7th, Gin Blossoms on September 8th and Georgia Satellites on September 9th. Located in downtown Marion, Ohio, it is the largest popcorn festival in the world annually attracting crowds in excess of 250,000. For safety and liability reasons, pets are not permitted on the festival grounds.